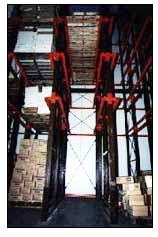 Optimize Space with Drive-In Pallet Racking. Drive-In p allet racking is a high-density system storing from 2 to 10 pallets or more deep. The unique design of this system is the density it offers within a small warehouse footprint. Ideal for LIFO product rotation of large volume, low-rotation, single SKU items; drive-in can free up to 35% of the floor space required by standard racking while storing 75% more pallets. The system is designed with a single fork truck loading and unloading opening which frees up valuable warehouse space and decreases storage and retrieval times. An ideal drive-in system requirement has a total pallet count of at least 4 full bays x the depth of each bay in order to achieve efficient inventory rotation.